These Italian-made, vinyl-coated Undershelf Baskets are great for storing napkins, dish towels, and table linens. Simply slide one onto an existing shelf. Undershelf Baskets is rated 4.7 out of 5 by 138. Rated 4 out of 5 by TomInFairfax from Does a good job These do the job. There is a pretty good selection of widths that allowed me to cover the width of my pantry well. They do sag a bit with weight in them but it’s not that noticeable. Also, the height in the specs is just the item, not the space it provides. Subtract about 3/4” to determine the actual space you’ll get. 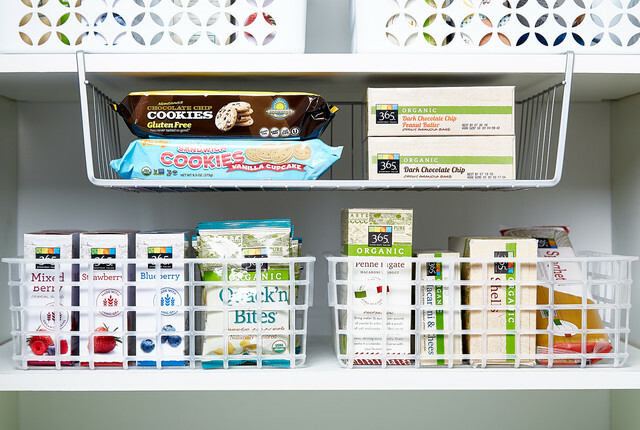 Rated 5 out of 5 by Soccermom42 from Great quality This under shelf basket has made my pantry so much more organized! My kids can now see where their snacks are. Rated 5 out of 5 by GoofyMe from Best storage in limited spaces Love these. I have quite a few. They hang on the shelf in my laundry area and free up space for more storage. Rated 5 out of 5 by RosemaryS from Perfect This was just what I was looking for! Doubled the useable space in my cabinet and keeps it organized. Loved it so much, I got 2 more! Rated 5 out of 5 by RochelleSimpson111 from Awasome way to increase vertical space This is an awesome way to increase the vertical space in so many cabinets both in the bathroom and the kitchen. Rated 5 out of 5 by Amberita from Most Efficient Use of Space I was inspired by a de-clutter magazine, and well, my husband LOVES tea and purchases new kinds every chance he gets. I gave him his own nook, and this rack provided a very thoughtful way to reach all his tea accessories in one place. The possibilities are endless! Rated 5 out of 5 by DCOrganizationLover from Great Product! I love using these! I've bought a few and keep going back for more. The only thing to keep in mind is if there is a shelf under the one you are using this on, how high the items on that shelf will be in case this product blocks that. Otherwise, I love adding these on to my shelves and taking advantage of an easy way to maximize my space. Rated 2 out of 5 by Kasue from Does not work with wire shelving These baskets are very sturdy and well made. However, they do not work well with wire pantry shelving. The baskets tip backwards and are not stable. The example is shown on a wooden shelf and I think it would probably be fine on a wooden shelf. I would not recommend these for wire shelves. Rated 5 out of 5 by TigerLizzy from Linen closet rescue I put these in my linen closest to help control the piles of washcloths and to store extra bars of soap and toothpaste and whatnot. So handy to be able to use all the space and still get to things. 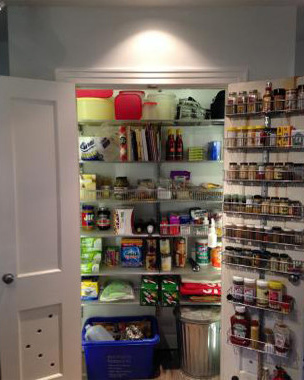 Rated 5 out of 5 by RoadQueen from Making Room I bought a house with a very small pantry. When I started to put my food and canned goods in the shelves, I realized there just wasn't going to be enough space. These Undershelf Baskets are lifesavers! It's made a big difference in what I can put in a tiny space. Rated 4 out of 5 by Lovethosebaskets from Be aware of the sizes I purchased this item, after being a loyal customer here for a while. The Container Store has been more than helpful to me many times over. However, the specifications for this item are misleading. I purchased the medium size basket, after measuring the space where I needed to install it. It was critical for me to use the measurements that were shown (I planned to use the basket to hold my DVR). When I received it, I found that the interior dimensions (width especially) are off by as much as 1.5 inches, and my DVR didn't fit. For example, the width across the basket states on the site, 16" wide. It's a 14.5" interior. (see photo) The 16" is due to the bend of the arms that hold the basket (they bow out at one point) and their thickness. The dimensions were critical because I needed the basket in a specific place under my shelf that wouldn't have room for anything wider. I would like for TCS to provide inside dimensions along with the outside ones so this doesn't happen to someone else. Rated 5 out of 5 by NaplesMommy from Great for getting extra space Love! Instantly found extra space in my shelving units. Things are spaced out and easy to find! Will have to get more! Rated 5 out of 5 by rizz from Love these! Have had these under shelf baskets in the past and loved them. These are even nicer. They increase the space in my cupboards and make them much more organized. Rated 5 out of 5 by Davis1054 from Undershelf Baskets Our container covers don't fall out anymore. I love it. I am having someone pick me up another one because I have room for it and the first one works well. Rated 5 out of 5 by Lauren525 from Love it I use this in my pantry for my tinfoil and plastic wrap. It opens up so much space for everything else. I would definitely recommend it to everyone. Rated 5 out of 5 by joellecut from Maximizing cabinets/shelves I have these in various areas of my home & love that they expand my storage. Rated 5 out of 5 by Organizekk from Practical storage Great to use unused cabinet space. I have a variety if sizes and love these baskets for travel coffee mugs, plastic lids, kids cups, etc. instantly makes things look more in place instead of in the way! Rated 5 out of 5 by luvbnagma from Extra Space - You Bet I love this undershelf basket. I only have 3 drawers in the kitchen (obviously not designed by a woman) and things that I don't want cluttering my counter tops or have to store away from the kitchen. These shelves made it possible to have everything I needed within reach. The product itself is a lot nicer than I had expected and is well structured. I highly recommend the undershelf baskets if you need just a bit more storage options without putting out a lot of extra cash. Rated 5 out of 5 by Alyson from Great option Love this product! Using it to store bread so it doesn't get crushed in the pantry! Rated 5 out of 5 by TexasQuilter7 from Great purchase We were trying to expand a too-small pantry. This worked great. Rated 5 out of 5 by Grammy22 from How Cool Is THAT! I needed a place to put my baggies, you know, snack sized, freezer, sandwich, etc. I kept losing them behind my dryer. I picked up this undershelf basket and low and behold, they don't slide out! It has a back-stop that keeps them from slipping out the end. They are handy, now, I can see where the right sized bag is and I have another basket for the wax paper, cling wrap, and tin foil. Nice and neat! Rated 5 out of 5 by ayec101 from Great idea! Whoever thought this up is an organizing genius! I use this in my pantry for my sandwich baggies because I have several sizes. I initially thought I was going to put bread in there so it wouldn't get smoothed. I may have to buy a few more of these. Im thinking laundry room and linen closet. This shelf is sturdy and well built. Highly recommended! Rated 5 out of 5 by Grammyowl from Best space saver This is one of the best space savers. I use it for my paper plates. Rated 5 out of 5 by tnw75 from No issues-wonderful product Another wonderful space saving product. My linen closet shelves are spaced very far apart so I used these to maximize the space and they work great. No issues. Make sure you are not trying to put them in a closet that has a rod in front of the shelf because you will not be able to get them in place if something is blocking the front of the shelf. Rated 5 out of 5 by sewnsew from great for wine storage I use this for storing bottles of wine and champagne. The bottles can be stored in space that had been unused. Rated 4 out of 5 by dreamweaver from good purchase I love that it makes wasted space useful. It shakes every time we open the cabinet door, guess I'll get used to that. Rated 5 out of 5 by bargainhunter from Perfect I used this in my hall linen closet to keep pillowcases together; slid it onto the shelf above the top sheets stacked neatly below. Just right. Rated 4 out of 5 by jessisca from Just what I needed I wanted a better way to stack coffee mugs in my cupboard. This let me add an extra row without adding an extra shelf or stacking cups on other cups which seemed broken cups waiting to happen. It is sturdy and can be filled with ceremic coffee mugs with no problem. Rated 5 out of 5 by FrequentShopperTX from Great space saver! These things are great for saving space, I put it in my linen closet to hold my rags. I love it and will probably get a couple more for others things! My only complaint is that it isn't deep enough. I can only hold one row of rags in there. I can put a second row but they would be hanging half off. I could probably try rolling them, and may be able to fit more that way. Right now I think I may have about 8 of my rags in there. Will the undershelf work with the standard wire shelfing commonly in pantry and linen closests. To be on the safe side, I would use the medium Medium Undershelf Basket White 16&quot; x 10-1/8&quot; x 5-1/2&quot; h 824060 You might have a gap on one end but it would be easier to get out. For kitchen cabinets above the counter, can you put this on the bottom shelf and close the cabinet door over it? As long as there is enough clearance between the door and the shelf. Does this lay items flat or slanted? If the basket is hung on a 1&quot; thick shelf, how much height is there to store things in the basket? Does the 5.5&quot; height include the shelf hooks? We have 1 1/2 inch thick shelves. Will this fit? Looks like they may be designed for 1&quot; thick shelves. Unfortunately, these undershelf baskets are made for shelves 1&quot; thick and would not work with 1.5&quot; thick shelves. There is no specified weight capacity. However, the Undershelf Baskets are designed to hold linens, mugs and similar pantry or cabinet storage items. Is it suitable for fridge/freezer? Our Undershelf Baskets are suitable for fridge/freezer use. Please see our other suggestions below that may be suitable for your needs. Which of these shelves are long enough to hold aluminum foil and plastic wrap? One is long enough: Large Undershelf Basket White (item: 824070) However, the rolls of wrap would need to rest parallel to the shelf since the item is less than 11&quot; front to back. The item's dimensions are 20&quot;w x 10-1/4&quot;d x 5-1/2&quot; h. If you are wanting to store your rolls of wrap where you can look at the ends of the boxes rather than the sides, you might want to try the Undershelf Placemat Holder White (item: 344040). It is 12&quot; front to back &amp; might work the best. It is open on the sides though, so keep that in mind. Its dimensions are: 18-3/4&quot;w x 12&quot;d x 4&quot; h.